Have you ever woken up from sleeping and found that you have fresh memories of just doing something, somewhere that is not in your pajamas in bed? Have you felt insane because of these “false memories”? Well don’t feel insane, because what you have experienced is a very common thing called “dreaming.” Everyone does it! Even dogs and cats. Dreams use a part of your brain called the Imagination Zone. When this zone is activated, imagination glands crank out a slime that gives you creative thoughts. Sometimes, it is used when you are awake, in order to imagine solutions, or to predict possible consequences. The Imagination Zone is the bustling factory that allows you, after enough practice, to imagine absurd scenarios that are very impossible, but generally fun. When you sleep, it is not really a little death. Your body still lives without you wakefully monitoring it, and this includes the zone mentioned in the last paragraph. While you sleep, it still produces thoughts and visions. Although without your conscious mind cautioning it for being too zany, it will go off the rails and sometimes even throw house parties even though it is a factory setting. But a factory location can be the best place to host a party, didn’t you know? 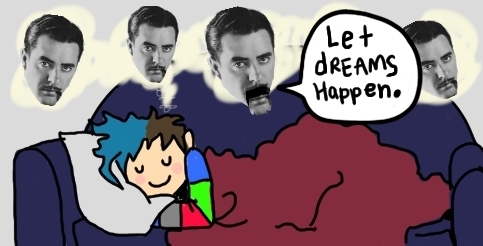 Upon first succumbing to sleep, you might notice that you immediately get dreams. If you intentionally wake yourself up a lot at first because you have that kind of time on your hands that you will experiment with your dreams, like I do, you will find that you are basically just thrown into a scenario. Being startled, you will often trip and fall. The falling wakes you up with a small flailing motion that anyone in the room will notice. If you want to experiment, too, I have found that what you should do is get ready for bed, but then daydream. Pay close attention to what your mind is doing. Normally, you will slip seamlessly from conscious thought to a dreaming state and never notice. But if you are paying attention, you can catch when the dream begins. For me, what happens is that someone is talking, but then they are suddenly not making much sense. They are just saying words, and there I am, lucid. However, as these are generally early-sleep moments, they are easy to wake up from, so they do not last long. But it is still a fun hobby, I believe. 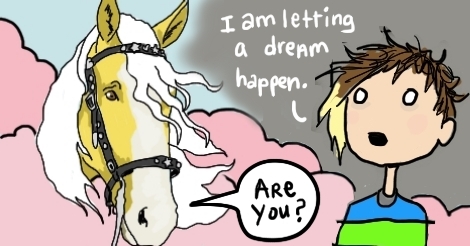 These dreams are nearly indistinguishable from everyday life. You are washing dishes, or vacuuming, or bickering with your sweetie. Or you are somewhere you know well, and don’t think for even a second that you might be asleep somewhere else. Some people only ever have these sorts of dreams. It is possible that their dream factories within are very small and understaffed, or it is possible that these people are practical right down to their cores. That’s fine, if so. Don’t feel bad. I don’t expect you feel like you’re missing anything. 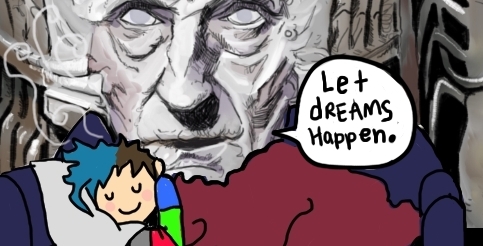 Personally, these dreams bother me because I have a fairly decent dream recall, but I have found that my memories of dreams I have had are stored in the same place that I store memories of actual events I have experienced. The only thing keeping me from getting totally mixed up is that I put a little sticker on these memories that says “Dream.” What if that sticker falls off? What if I forget to put it on there? Then I will think things have happened that haven’t and some days that is too much to contemplate. To be fair, not all entertainment dreams are blockbusters. Some are indie films and some are just sitcoms, but they are all fascinating. The sets are unbelievably detailed, the plots don’t always make sense, and they don’t even necessarily star you! These dreams are as varied as the media we consume, and they are generally a little sad to wake up from because you get cameo appearances from celebrities, or the characters they play. These are the dreams that I wish we could record in order to watch later or show to friends — maybe even sell. I have these kinds of dreams most of all. I’m not sure if it’s because I am a “creative person” or if it is because I don’t often watch TV or movies, so my brain is making an effort to be entertained, like a lonely only child in the days before the internet or electricity. My favorite part of these kinds of dreams, honestly, is that I usually am in a setting of a place I have never been, and it is so detailed and realistic, that I secretly can’t believe it isn’t a real place. There are ambient sounds of harbors, smells wafting through the air of things that I never see or interact with, people carrying on with their lives and not paying any attention to me at all — it’s all so mysteriously real. And then the plot kicks in and it is usually just a very big adventure and I probably should be writing books, who knows. I love it. I want to be asleep and dreaming right now. Bad dreams are the pits. Inside your skull, there is a geography of the mind, and the bad dreams are literally pits. Sinkholes of the soul. Canyons and swamps and other things that you can fall into and become mired in. Nightmares range between “bad dreams” which are basically explorations of your stresses such as there being a spider on the wall in the room, or mushrooms growing out of your face as you look in the mirror, or that unsettling kind where you wake up from a dream AND THEN WAKE UP AGAIN maybe even a few times so that the rest of the day you wonder if you are still in a dream and are about to wake up, to “night terrors,” which for whatever reason you wake up from because you are screaming, screaming, screaming your terrified head off. I get bad dreams, I guess. But they present themselves as sort of an annoyance, usually. When I was very little, I had the night terrors and I had them with enough frequency that my mother suggested that I learn to face my fears while in the dream, and see what happens. As it turned out, what happened was that these repetitive dreams concluded, and I woke up alive. From that moment forward, I was a dream warrior who didn’t fear anything, and could either simply tell things to stop and go away, or I would actually kill them. What a time! Now, the nightmares can be fun, so I can’t even call them nightmares. Now I call them “ego boosts” but with the acknowledgment that it is probably foolish to have my ego boosted irl from a dream situation. It is alleged that some people have dreams which can warn them of events that might happen in the future, since time isn’t linear and what are dreams anyway. If a person wakes from a dream in which they just died in a car crash on a certain bridge, they might choose to avoid crossing that bridge for a little while, until they begin to feel safe again, or to feel foolish. Sometimes people will dream of the death of a friend or relative, and then that does happen pretty soon after. Sometimes it is pure coincidence, and sometimes it seems to happen an AWFUL lot for that particular person and they grow a reputation for clairvoyance or whatever. Edgar Cayce, a Kentucky fella, was known as the Sleeping Prophet, and foretold many things while asleep. I haven’t read up on him, but I would like to visit the museum about him in Hopkinsville, KY, someday. Road trip, anyone? Personally, I am not a prophetic dreamer, for some reason. Therefore, I am inclined to believe it is not a real thing. The best I’ve done have all been been jealous-rage based, where I have had dreams about specific girls out of the blue and then asking my then-boyfriend about them and he’s like “omg she called me the other day to catch up” and then I hissed and got out the voodoo doll. Sane, level-headed reactions. I don’t know what those are other than predicting that I’ll get mad about something that was bothering me anyway, combined with the suspicious coincidences that probably would have always had the same reaction of “oh how weird that she contacted me randomly [shifty eyes].” Oh sorry I thought I was on livejournal. Next section. If you get very good at dreaming, and paying attention, you can create a new way of existing. It is a blend of sleeping and being awake. As I mentioned in the Fragmented Dream section, all you must do is simply notice that things aren’t making sense, and then, instead of waking up, and instead of just going along with it to see what happens, you make it known that you know you’re dreaming. Then everything changes. In my experience, when you become aware of dreaming, it is as if the dream is a thing with its own mind, and you are meeting it. I suppose it could be just your Subconscious that you are interacting with, but it is a little disconcerting that it seems so separate from yourself. When I announce that I am aware that I am in a dream, all ambient detail melts away and I feel like it’s just me in the middle of nothing, but contained inside of a room. Once, it was a room of maps of Effigy Mounds located in Ohio, the one nearest to me was Siep Mound which I eventually went to and found a five leaf clover pretty soon after I stepped out of the car. I don’t know what any of this means because I don’t do dream interpretation. One last thing on lucid dreaming: it actually can get deeply unsettling in ways I find hard to describe. And in my experience, being forceful in it leads to disaster. Also it’s so easy to accidentally wake up, and so difficult to get into the lucid state in the first place, that it can be a very frustrating journey. There seem to be a lot of sites, books, and youtubes about it though, so it is an endeavor studied by lots more people than just me. In this one case, I freely admit that I’m a novice and not an expert, for a change. These other people say that lucid dreaming can be a way to better understand yourself and work things out, and that’s the most fun of all so get to it!